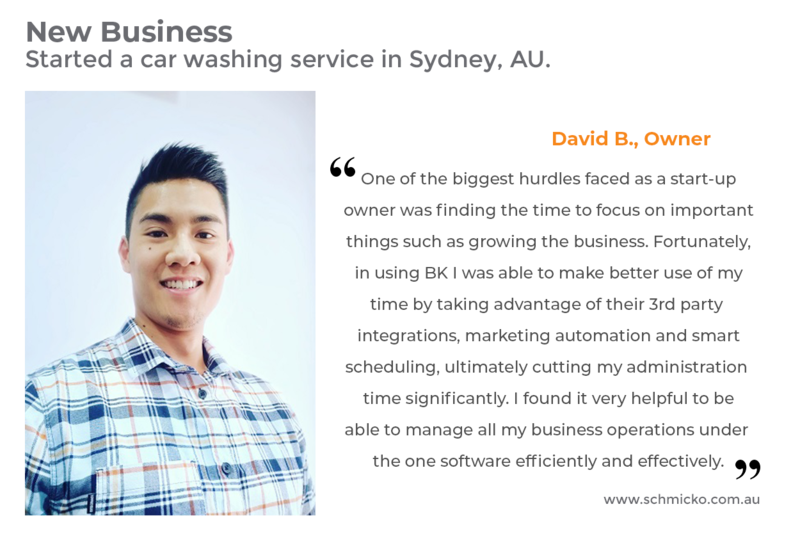 BookingKoala - Awarded Platform For Service Businesses. Cleaning services, dog walking services, marketers, tutors and many more. From booking clients online when you’re sleeping, to managing your business on the go. It is all here in one place. Sign up for BookingKoala free. No risk, and no credit card required. When you need to find more clients, give pricing, find availability, send out a confirmation, send out a reminder, gather feedback, get reviews, charge the client, send payment, and more. BookingKoala has you covered. Set up your store or use our default options for new start ups and launch in less than 60 seconds. Gain access to our marketing features helping you gain more customers. Run your business from anywhere in the world with mobile access. Connect with MailChimp, Zapier, Stripe and your other favorite apps. Use our free theme or use your own existing website. Thousands of people from all industries, sizes and countries trust BookingKoala. Whether you have a website or not, in less than 60 seconds you can have access to features that will take your business to the next level. You can track providers via GPS and providers can also clock in/out per each job allowing you to understand how long they’ve spent or travelled to a job. 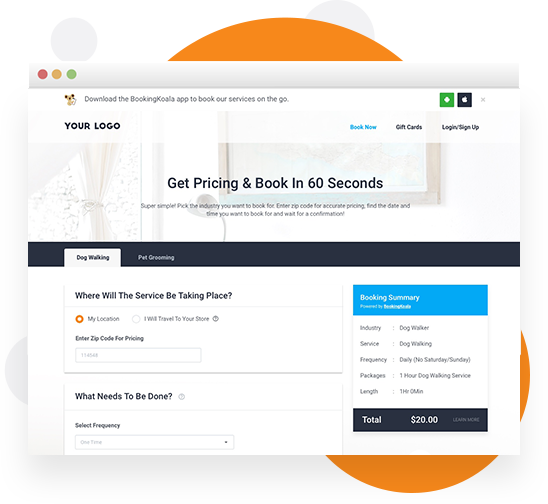 Sell clients online instantly using our highly converting booking forms, even when you are sleeping. Use it with our theme or install it on your existing website. Completely mobile friendly and optimized. You can start your business in seconds using our simple theme or place our booking forms, gift card pages, and login pages on your already existing website. Need help? Just ask and we will help you for free. Super easy to set up your pricing, locations, forms, colors and branding. You will never have to hire a developer or spend time or money coding ever again. Manage your business from anywhere in the world using your phone, tablet or computer and allow customers to book through any device at anytime. Your providers can also manage their schedules on the go making their lives much easier. Customers get their own dashboard where they can control and view their appointments, refer friends, buy gift cards, and more. As an admin you receive an account with full access where you can change/manage settings, add staff and control what they can see. Your service providers will get their own account where they can see their upcoming bookings, view their payments and much more. Set your prices to fit your business, whether it’s based on quantity, parameters, hours, minutes, packages and many more different set up variations. Accept different types of payments from you customers whether they are booking online or they are simply calling in to make an appointment. Allow customers to see real time availability based on working hours of your providers or teams and rules that determine if they are open or not. 100% accuracy, instant scheduling, and hassle free. Activate an Uber like feature, forcing providers/teams to accept/decline a job before it is confirmed. Accurate recurring scheduling/rescheduling and built in up-sells to turn more one-time clients into regular recurring appointments such as; built in discounts based on frequency, segregated email lists, automated promotional emails and more. 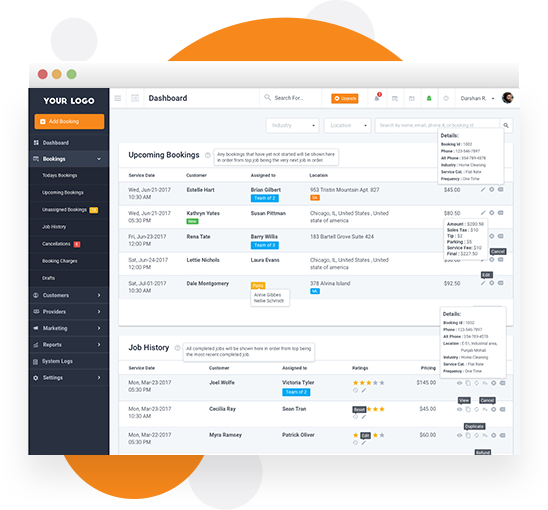 View all your bookings in one place organized by different tabs (Upcoming Jobs, Today’s Jobs, Job History) and more. Made for scalability and quick growth. Save jobs as drafts and come back to complete them later. If the time you selected is gone, you will be required to select a new date and time. Real accuracy for instant scheduling. Allow customers to book same day bookings and charge additional fees for expedited service (optional). Send invites to providers to pick up unassigned jobs. Your providers and teams can also grab unassigned jobs they are qualified for from their own dashboard if allowed. Allow bookings to be scheduled with individual providers, create your own teams, or pair 2 or 3 individuals together. Schedule appointments based on not available providers and/or teams and mark them with a NA tag letting you know they usually don’t work those hours. Easily pay out all service providers from inside the software with automatic payroll calculation. Collect tips from customers to help your providers and teams earn more money. Make charges, refunds and manage all of you customer payments in one spot. You may also activate a feature that charges a booking after it has been completed saving you time. Charge expedited fees for same day appointments to bring in additional revenue. Set up cancellation fees based on services cancelled in order to stop short notice cancellations. Add in mandatory reasons to choose from when cancelling so that you can run reports to determine why customers are cancelling. Activate email notifications to be sent to you, your customers, your providers and your office employees. You can design each email template yourself or use our default design. Activate SMS notifications to be sent to you, your customers, your providers and your office employees. Each notification can be customized in seconds. Activate APP notifications to be sent to your customers and your providers. Each notification can be customized in seconds. Activate awesome system alerts to help you and your office employees get organized and be aware of upcoming tasks and activities. Add coupons to increase your revenue with tons of features and restrictions. Later offer those coupons and allow customers to use them while booking online. When someone doesn’t finish checkout, you can launch an email sequence to them automatically and help recover a lost sale. Give $50 – Get $50 built in referral system to help your company grow. Can be adjusted or disabled. Allow your customers to purchase gift cards with automatic balance tracking. Later customers can book with gift cards to help you bring in more sales. Can be disabled. Allow the merchant and providers to interact from inside of their accounts through an internal live chat feature. Full rating system that tracks how your service providers are performing as well as your company. It can also be displayed to your customers to help increase conversions during booking. Activate a feature to help customers spread a word about you via Facebook in exchange for a coupon code. This feature is built to help you gain more clients for free. Powerful logging system that tracks all actions done by all users. Built in reports to help you scale your company such as which services are sold most, why customers are cancelling, revenue brought in and many more. Charge sales tax per location, run reports based on sales tax collected and more. Connect with Zapier, Stripe, Google Analytics and many more of your favorite apps in seconds. Set up different locations and schedules, set different prices per location, different sales tax, and much more. Our forms will determine pricing per zip code or per store if one is activated. You can also active a multi-time zone locations feature helping you manage bookings in that are in different time zones. Automatically get more reviews on your Yelp, Google, Facebook and other social pages. Also allow customers to share their reviews on Facebook and Twitter or even display them on your website. Enable appointments being performed at your location, your customers location or both. If you do appointments online, call the location online which will be automatically selected when booking. For example if you are a cleaning service and you offer: home cleaning, office cleaning, and post construction clean-up, you can set up 3 different industries with 3 different pricing points for customers to book from. Form online checklists for your providers and teams to complete as they go and allow customers to view them only if completed. Activate a quote form customized by you to help you sell more clients. You can use this with our theme or place the quote form on your existing site. Join us today for free and see how easy we made it to grow a service business. Businesses both small and large choose us to sell because of our easy setup, remarkable features, and industry-leading ability to grow your business. 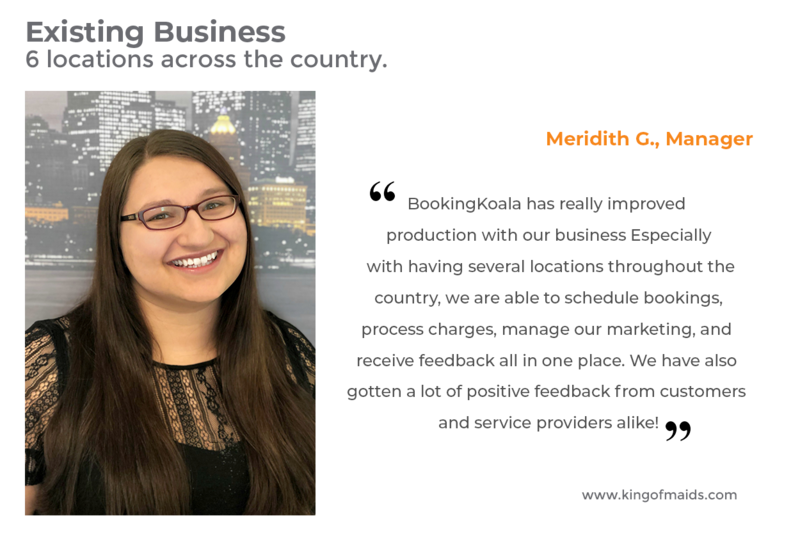 Learn Why BookingKoala Is Right For You!